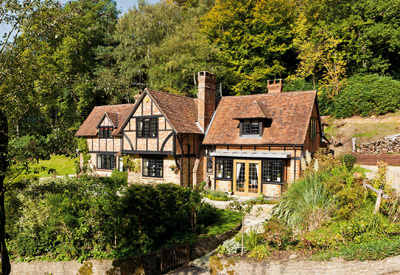 AS the county with the highest proportion of multi-million-pound properties to be found outside central London, Surrey tends to set the tone for the country-house market in the rest of the UK. So spirits rose when, despite a difficult second half of 2010 (when hopes of a late-autumn revival were mostly buried in the pre-Christmas snow), Knight Frank reported signs of a revival in the torpid Surrey market with the sale of Hollow Lane House near Virginia Water at a guide price of £8 million, Dalegarth in Esher at a guide price of £9.75m, and Hawks Hill near Guildford, at a guide price of £6.95m. The buyers are definitely out there-it’s the vendors we need, say leading agents throughout the county, hoping that the prospect of a 1% rise in Stamp Duty in April will be the catalyst that persuades hesitant vendors of high-value properties to move centre stage. And although a handful of high-priced sales in the exclusive enclaves of north Surrey might seem irrelevant to agents struggling in the south of the county, there is a historic trend of London buyers starting out in the north and gradually sliding down the A3 towards Guildford and beyond. As Richard Winter of Savills explains: ‘Buyers living in Fulham, Barnes or Wandsworth who are looking to move out of London often head south of the M25 in the first instance, but find it all a bit too rural and end up buying in Esher, Cobham or Weybridge. Later, as the children get older and schools become a priority, they look to move to villages around Guildford, Reigate or Farnham, which offer a great choice of schools and more land for less money. Typical of the trend is the sale of the classic, tile-hung Huckleberry in secluded Blackhills, Esher, whose owners have accumulated six children between them, and are now looking to spread their wings. Originally built as a cottage in the 1920s or 1930s, Huckleberry has seen its wings extended in both directions, to provide 7,416sq ft of accommodation on three floors, including four reception rooms, a kitchen/breakfast room, six bedrooms, five bathrooms, a gymnasium and an indoor-pool complex, set in roughly an acre of landscaped grounds. It comes fresh to the market through Savills (01372 461900) at a guide price of £4.5m. International buyers are a major pillar of the north- Surrey market, as are international vendors. The same agents quote a guide price of £5.25m for White Webbs in sought-after Esher Park Avenue, Esher, on behalf of its owner, who is returning to her native Sweden after 20 years. Behind the familiar early-20th-century ‘Tudorbethan’ style of the exterior, the decor of the interior has been executed in white throughout, creating a remarkable impression of light and space. This classic, elegant family house has four reception rooms, a conservatory, a kitchen/breakfast room, four bedrooms, three bathrooms and a self-contained annexe. But the harsh reality of life in today’s Surrey marketplace is driven home by the relaunch of the delightful, Grade II-listed Manor House at Headley, near Leatherhead, which was valued at well over £6m when first launched on the market a year ago, and is now being offered by Savills (020-7499 8644) at a guide price of £4.95m. Surely the ultimate dream of any southbound buyer, the Manor House was built in 1903 in the traditional Georgian style by the eminent Victorian architect Guy Dawber. The imminent repatriation of another international vendor is an opportunity for a south Surrey buyer with more modest ambitions to acquire the idyllic Madgehole, near the pretty village of Shamley Green, seven miles from Guildford. Strutt & Parker (01483 306565) quote a guide price of £2.3m for the timbered red-brick house, first built in 1936, which has planning consent for a single-storey extension. Set on high ground at the end of a private road, Madgehole stands in more than 11 acres of lawned gardens, paddocks and woodland, looking westwards over a gloriously untouched valley. The cottage-style interior offers four reception rooms, a kitchen/breakfast room, four bedrooms and three bathrooms. The grounds include a barn with a games room, and a sheltered outdoor swimming pool.